Tell me about Key Digital. What background can you give me on the company? This link will help – http://keydigital.com/introduction_.aspx, but here is a quick summary – Our company is a privately held technology firm that designs and engineers all of our own products based in the USA. Being 13 years young we have established our brand as the tier one player for complete HDMI connectivity solutions. These products and solutions are brought to life by HD pioneer and Guru Mike Tsinberg (CEO & Chief Engineer and patent holder for HDTV and DVD technologies, he also won a technical Emmy for DVD.) Mike and his team of engineers are responsible for the solutions we have that meet and exceed the needs of today’s most advanced AV installations. What makes Compass Control® such a significant evolutionary step for Key Digital®? Most offerings in the market for automation come from software companies – for 13 years we have been building some of the most advanced hardware solutions for Digital AV connectivity. Our customers demanded a better way to control not only our hardware but also the other products in the eco systems they are specifying. What can you tell me about Compass Control®? 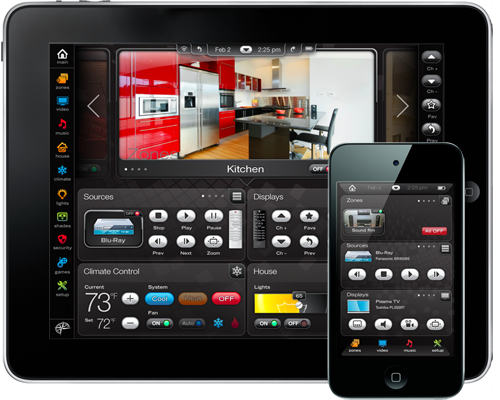 Compass Control allows its users to use iOS devices as a completely blank slate for controlling traditional AV gear and giving you the option to control many other components in the home or office such as lighting, window treatments, HVAC, and more with IR, RS-232, TCPIP, or an on off switch. All use the iDevice as the main control point, by using a pre made template or customizing the buttons pictures and anything else they would like to see or do with the iDevice. 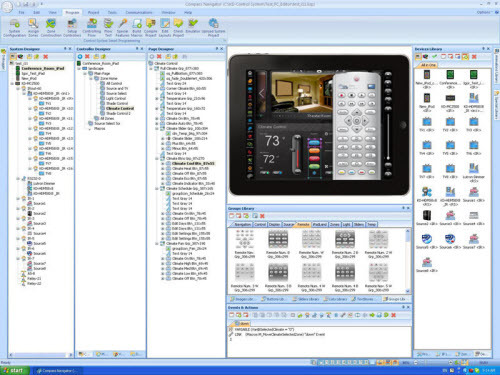 Compass Control is also the direct result of a marriage between Key Digital hardware and software engineers – having both HW and SW under one roof allows for more reliable installations and better synergy between advanced AV connectivity products like Matrix Switchers and the central control components. For example, customers looking for a 4 source, 4 display fully automated system would need hours of research and possible field beta testing to make sure the HW (switcher) and the SW (the control system) will work together as they should. Compass Control removes any chances for error when integrating the HW and SW plus with our Compass Alliance Partners – we will not only classify these companies as “compatible with” but go the extra mile and have our own engineers take top products from these partners and bring them in-house to create two way drivers to make sure the installation and user experience is as clean and profound as if the components were right in front of them using the factory remote. which BTW you can manipulate and create that remote on the screen of your iOS device when using Compass Control. How does Compass Control® differentiate itself from other control systems from AMX, Crestron, Savant, and Control4? Well as mentioned before, we are a hardware company first and many of our competitors started in software and had to adapt by purchasing /partnering with HW or OEM solutions from unproven vendors. We also embrace the iDevice unlike anyone else. 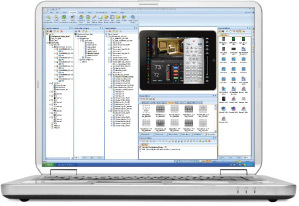 Allowing for the look and feel of the system to be completely designed by the installer. The iDevice doesn’t have to look like a consolation prize in a control system game show, but the main access point w/o the limitations others put on the iDevice. Plus – we use standard practices of installation and implementation and are not constrained by existing hardware – so our control system lives on the iDevice and is not just a back door into an analog system. Many control companies look at the Post PC revolution (led by Apple) as a threat or even kryptonite to their business. Our position is to lead the Post PC Analog Control System revolution with Compass Control. Why would a client spend more than $399 (the cost of an iPad2) for a slow, clunky, hard button remote or LCD, that doesn’t have access to over 585,000 apps, a built in camera, built in speaker, wifi, 3 or 4g, Bluetooth, Airplay, HDMI out, or even a 10hr battery that they can do almost anything they would want to do with? What parts make up the complete Compass Control® system? What are the future plans for Compass Control®? Is it only limited by size? We are just getting started. Since Compass Control is a digital system, it has no glass ceiling, so from the largest home to a sports arena with 500+ iDevices or control points in the system. Compass Control has been built and tested for the most complex projects out there today and tomorrow. Our architecture and road map for the category is very clear, we will continue to stay true to our customers and help other Compass Alliance Partners every step of the way. How does one go about purchasing or acquiring Compass Control®? First I would recommend the HomeToys Fans to take their iDevice and download “Compass Control” which is a free download from the Apple app store (once downloaded click setup, registration, and get demo) and play with it and start imagining how Compass Control can be a part of their lives. Once you are ready to control your home or office, send an email over to sales@keydigital.com and mention the HomeToys story and we will connect them with a Factory Trained Compass Control Authorized Dealer who can visit with them and evaluate the needs of their system and match up the best solution possible. Compass can hit all ends of the control spectrum and take their system beyond control.